Kilimanjaro Dispatch: August 6, 2014 – Hakuna Matata! Well this is Herman, guide of Berg Adventures and we are now on the mountain on our second day. We started yesterday from the hotel and then went to the registration and then started from the trailhead. Everyone has been great since we got to the camp yesterday. Everything is good! We have been singing songs and everyone is happy! 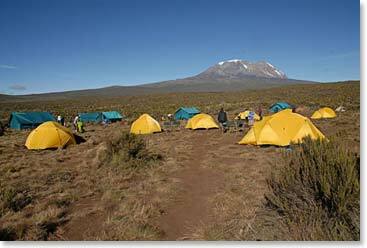 We are having a lunch already and then we are heading to Shira Camp 11,500ft. So far everyone is doing great, outstanding! Everyone is enjoying their trip. Thank you and we will come back to you tomorrow when we move to another camp. As Herman may have told you we are on or way moving from Big Tree Camp to Shira at 11,500 today. The weather on this side of the mountain has been dry this year which makes the walk easy. It is a bit dusty but now we are relieved to have some clouds coming in as we approach 11,000 feet. Today is a long walk and the team is doing great. 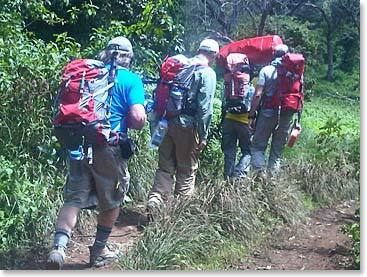 We are having a really good time as we approach higher elevations on Kili. For breakfast this morning we had omelets, sausage and porridge, our normal fair but Edward had been asking about having Ugali. And the staff always has Ugali so they served him some of the traditional Swahili food. It is cornmeal paste with sausage. This morning they had a delicious cooked spinach sauce that went with it. Edward had his Ugali for breakfast and he liked it so much he said he wanted some take out! So the guys wrapped some Ugali up in tin foil wrap for him and he carried it and had it for a mid-morning snack. 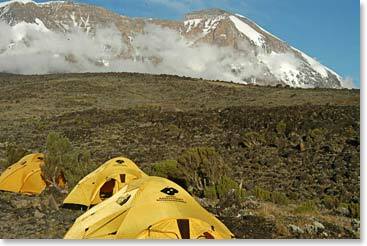 So we are enjoying life here and having a great time on Kili as we climb towards the Shira Plateau.